A half-dead dog swimming in the ocean…two missing divers… treasure coins that don’t belong to any known shipwreck treasure. This is a Captain Finn Treasure Hunter short story. Captain Rex Finsmer, the gruff-seeming yet soft-hearted shipwreck treasure hunter, and his protégé Phillida Jane Trent are also animal lovers. So when they spot a dog swimming miles out in the Gulf of Mexico they don’t hesitate to save it. But when their mission to find the animal’s owner leads them to a callous murder, all for the sake of greed, they turn their attention to finding the killer. In doing so, they put themselves in danger. If you enjoy fast-paced intrigue with a dash of fun, you’ll enjoy The Boneyard Murder. 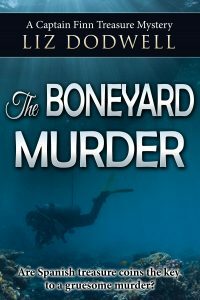 The Boneyard Murder is the fifth book in Liz Dodwell’s Captain Finn mystery series. All books can be read as stand-alone stories.